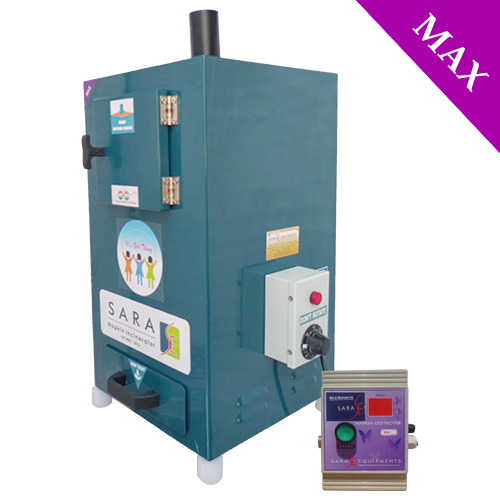 We "SARA" is a Manufacturer, Whole Sale trader, Supplier of Eco-friendly Sanitary Napkin Incinerator. All over the world, the disposal of the used Sanitary Napkins has been a very common problem. Especially in India, the used napkins are thrown to bathroom dustbins as it leads to embarrassing visuals and smells and the used napkins are flushed into the Drain. Both the above methods of disposing of Sanitary Napkins create problems. Here we provide the best solution for this problem by providing Napkin incinerator with Eco-friendly. 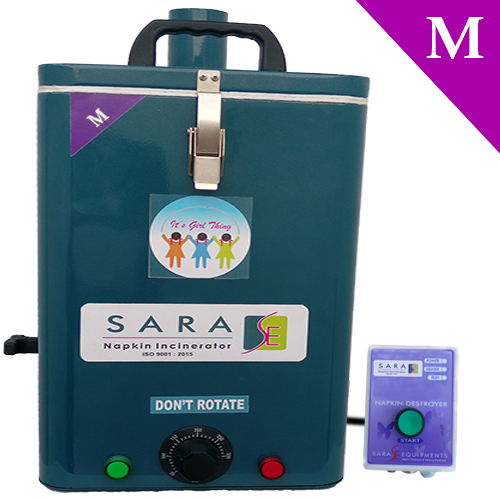 A Low-cost Sanitary Napkin Incinerator Machine, which is called as SARA Sanitary Napkin Pad Disposal Machine, will help numerous women in discarding sanitary napkins with scientific and Hygienic way. 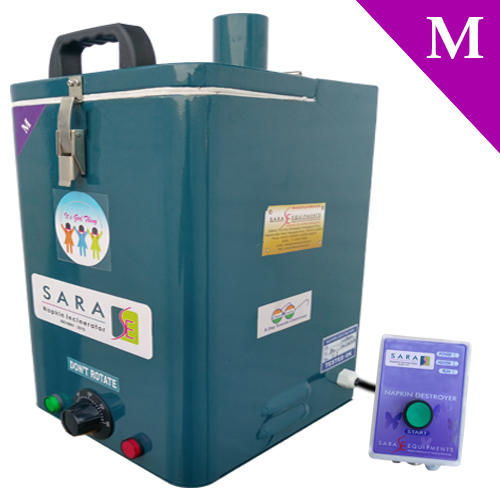 Sara Equipments – Our Sara Menstrual Sanitary Pad Incinerator Machine manufactured by high and premium quality types of raw materials such as stainless steel, mild steel with 7-time epoxy powder coating. Our manufacturing and production process undergoing heavy augment development in our competitive market. Features:•	Wall and floor mountable.•	Outer body: Mild steel with epoxy powder coated with the 7-time process•	Inner body: stainless steel•	Display: LCD display for temperature and time indication•	Insulation: Double-wall ceramic board technology ‘PUF’ insulation for maintaining thermal process •	Ash Tray: By using that tray easily removing burned sanitary napkin ash.•	Large Big door: It is used for loading a sanitary napkin inside the box•	Power / Electric Maintenance: Consists of double staged computer programmed control panel. For that reason, heater life is very long and it keeps very less electricity bill.•	Available with the model of Home and office model, school and college model, and industrial model.•	Note: Prices vary according to the size of the machine, model of the machine, mode of manufacturing material, and quantity of machine. 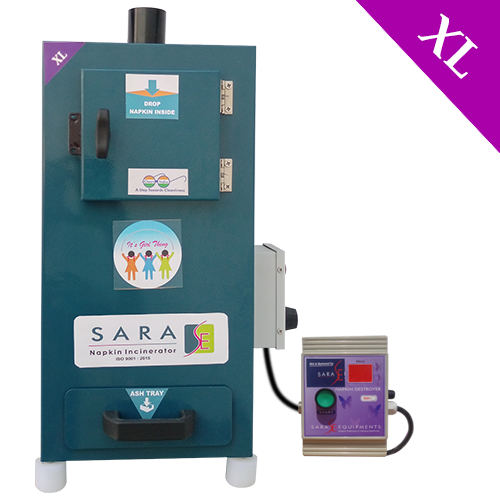 Sara Equipments – Find here top best qualities of Sanitary Napkin incinerator Machine, sanitary Napkin burning machine, Napkin Destroyer Machine, Pad disposal Machine, Pad Burning Machine, sanitary Napkin vending machine, Sanitary pad vending machine, Sanitary Pad Dispenser Machine. •	Wall and floor mountable model. •	Top of the machine having large door, thus enable loading the napkin. •	Initial time only it took 20 minutes, after that it won’t require high power. For that reason effectively reduce electricity bill. •	Available with multiple size: Such as 50, 100, 200, 300, 500, 700, 1000, 2000, 10000 napkins per day. •	Note: Above mentioned price is only for bulk requirement, for example purchase above 10 machines. So price must vary according to the machine model (mild steel or stainless steel), Type of the machine (Front or top loading machines), number of napkin burning capacity at a time, and Number machine should be order. 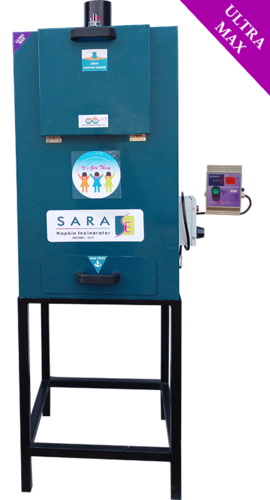 Sara equipments – Sanitary Napkin Burning Machine at Sara equipments are mainly produced for School and college going girls and working women’s. At that time of manufacturing, we always keep in mind and heart the following principles. 3. Must be improving pollute free hygienic environments such as water pollution free environment and air pollution free environment. All those things are our main aim. So by consecutive all this concept, our Sara Equipments mass production of Good and best quality of Ladies Sanitary Napkin Destroyer, female Sanitary Pad Incinerator Machine, Girls Sanitary Pad Disposal machine, women’s Sanitary napkin burning Machine, ladies Sanitary napkin vending machine, Girls anytime sanitary napkin dispenser machine, etc. It maintains the water passageway must be clear and clean. Ceramic Wool: It has used for heat and electricity maintenance. Ash Collection Tray: This tray kept in the bottom part of the machine, by following that easily discard the burned ash. 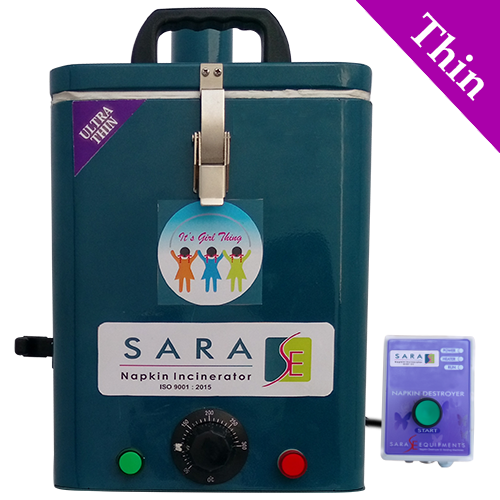 Sara Equipments – Due to the advanced technology and highly skilled experts, we are manufacturing the best and first quality wall mounted Disposable sanitary napkin incinerator, sanitary napkin burning machine, sanitary pad disposal machine, sanitary pad disposal unit, sanitary napkin burning machine and sanitary napkin vending machine. • Auto-Cutoff, this facility enables no human need for assistance purpose. •	Simple installation and machine maintenance. •	The upper part of the machine having the large door, by use that door, easily place the used sanitary napkin through itself. •	The bottom part of this machine consists ash collection tray, in which we have easily collect sterile burned ash. •	The outer surface of the machine fabricated by mild steel and coated with epoxy powder done in the 7-time process of coating. •	An inner part of the body manufactured by stainless steel. Note: Prices must vary according to the size, specifications, number (Quantity) of machines. 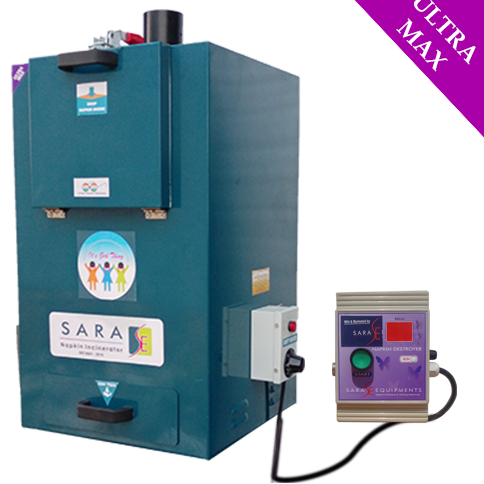 Sara Equipments – Our Sara Compact Model Sanitary Napkin Incinerator Machine built with high quality raw materials such as mild steel for outer body, stainless steel for inner body, ceramic wool for thermal or heat management. 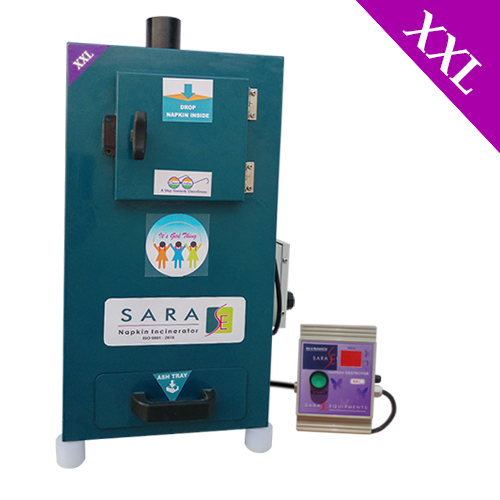 This Sara Sanitary Napkin Incinerator mainly used in Schools, Colleges, Ladies toilet, public toilet, Maternity Hospitals, Airport, Marriage Hall. Note: The above mentioned price is only for Bulk Purchase. So prices may differ according to the size, model, and no of machine to be order. It is a Sanitary Napkin destroyer with auto-off feature built with safety, reliability long life in mind. It is an environment friendly product instant solution for disposal of used Sanitary Napkins in a scientific hygienic manner since the napkins get burnt to sterile ash. Used Sanitary napkins are usually disposed off in dust bins or open surfaces which may give rise to various contagious diseases or when they are disposed off in toilets, they lead to block –up of sewage systems. To overcome this common problem, an easy to use Incinerator is designed that scientifically destroys the used napkins without causing any harm to the environment. · Easy Operation: Switch it on forget. Note: Above mentioned price is the starting model price of the product; prices may differ according to the size and number of machines ordered. 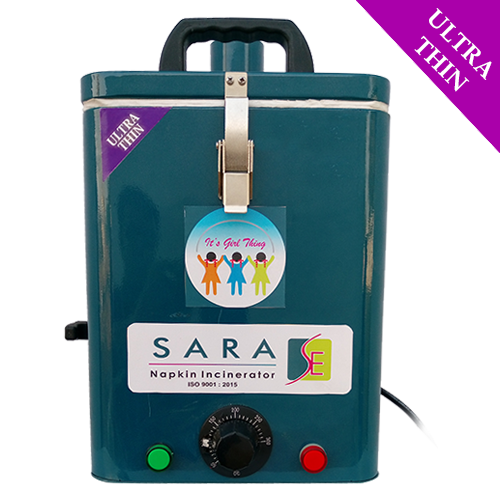 Sara Equipments – Sara Sanitary Napkin Destroyer Machine, by using this machine easily destroy the used sanitary napkin with environment-friendly way. Installation procedure and maintenance procedure very easy way. Not need highly technical knowledge. In this world, disposal of the sanitary napkin is a very complicated problem for all working women’s as well as school and college girls. Improper disposal of used sanitary pad causes a lot of health-related problems. Due to that reason, we are providing this type of feminine hygienic product such as a sanitary napkin disposal machine and vending machine. GST and Installation Charge Extra. 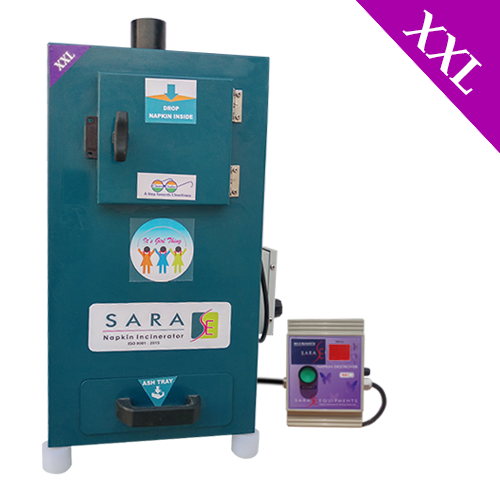 Sara equipments – Firelit Sanitary Napkin Incinerator machine at Sara equipments are mainly designed for School and college going girls and working women’s. During manufacturing time we always keep in mind the following principles. 3. Must be promoting good hygienic environments such as water pollution free environment and air pollution free environment. All those things are our ultimate goal. 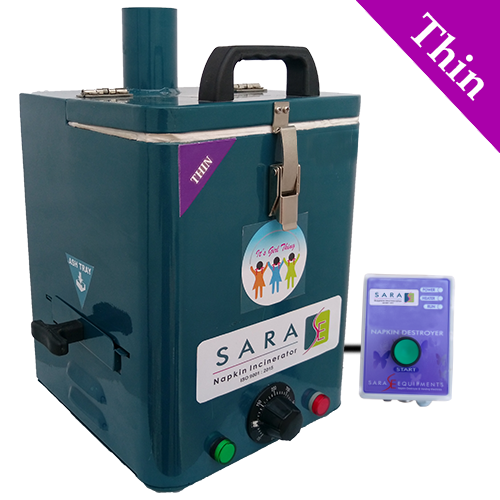 So by following all this concept, our Sara Equipments manufacturing Good and best quality of Sanitary Napkin Destroyer, Sanitary Pad Incinerator Machine, Sanitary Pad Disposal machine, Sanitary napkin burning Machine, Sanitary napkin vending machine, anytime sanitary napkin dispenser machine, etc. It keeps the water passageway must be clear and clean. Our firm has acquired a distinguished market position in manufacturing, supplying and wholesaling a broad array of Napkin Burning Machine has High Quality with Minimal Cost. 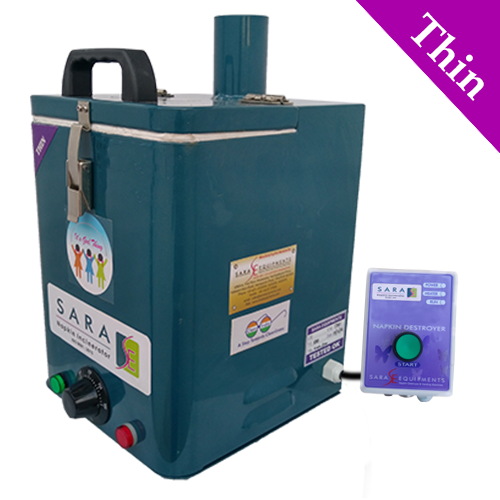 Smallest in size, the offered incinerator is used for undertaking the burning of sanitary napkins in an efficient manner. Being compact in size, these incinerators can be easily placed on wall, in an open area or can be mounted on the wall of washrooms. Fabricated under the guidance of UNICEF our offered machines ensure to function properly. 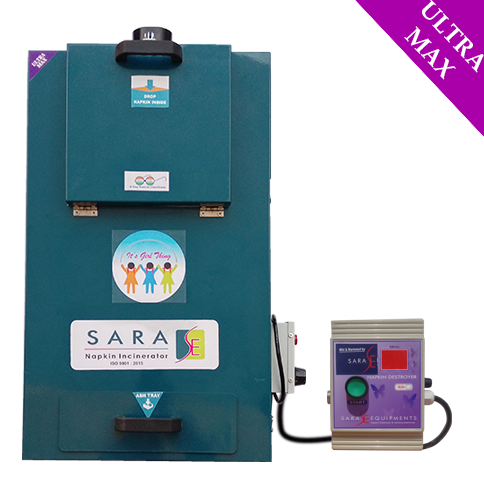 Sara Equipments: SARA, Sanitary Napkin Disposal Unit is used for instant disposal of used sanitary napkin in a very scientific and hygienic way. Very compact in tsize, can be mounted inside the toilet. Note: Above mentioned price is the starting price of the product: prices may vary according to the size and no of quantity. It is a Sanitary Napkin destroyer with the auto-off feature built with safety, reliability long life in mind. It is an environment-friendly product instant solution for disposal of used Sanitary Napkins in a scientific hygienic manner since the napkins get burnt to sterile ash. 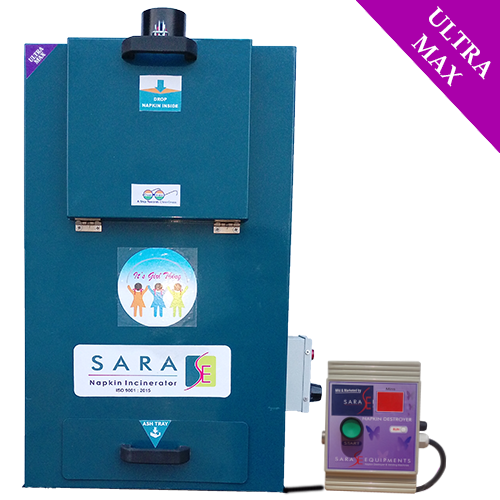 Our discipline expertise has enabled us to offer the highest range of Eco-Friendly Sanitary Napkin Incinerator with Best Quality and Cheapest Cost in the market. The Napkin Incinerators produced by us help in fulfilling the safe burning requirements. These Napkin incinerators are manufactured in obedience with the guidelines provided by the specific pollution control boards. Our organisation is one of the famous organisations in offering Napkin Pad Disposal Machine which possesses Best Quality in addition to Cheap Cost to our customers. Some of the remarkable characteristics of our range are wall mountable, eco-friendly and wonderful appearance. It is free from all types of flaws. Our Machines available in all kind of model. In addition to our Virgo Incinerator manufacturing process under the guidance of UNICEF. 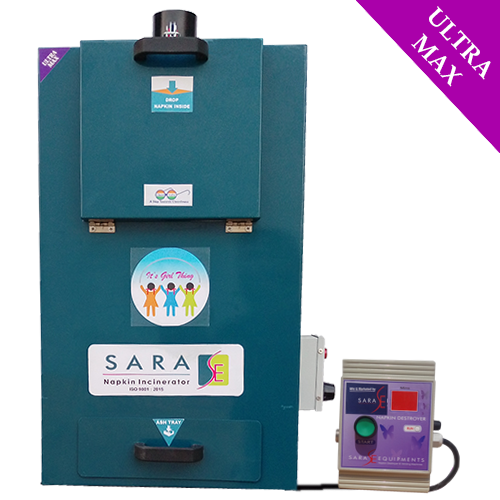 Sara Equipments: SARA, Sanitary Napkin Disposal Unit is used for instant disposal of used sanitary napkin in a very scientific and hygienic way. It won't create any harmful effect to environment. 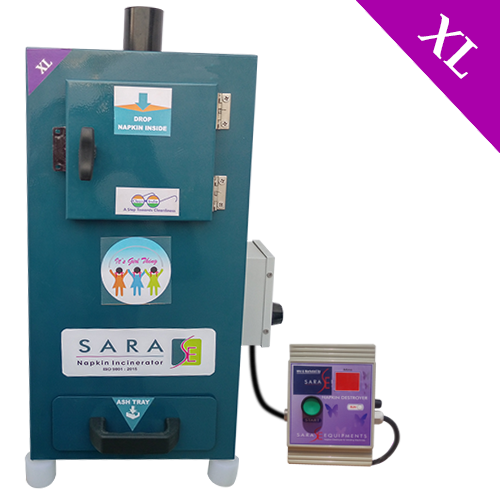 Our Sara Equipments is one of the well-known manufacturer, trader, supplier, wholesaler, and the exporters of Virgo Mega Model Sanitary Napkin Incinerator Machine for Public Rest Rooms under the brand name of VIRGO. Our fabricated Pad Disposal Machine is mainly applicable in school, college, medium scale industries, and small the hospital. “Sara Equipments” manufactures Sanitary Napkin Incinerator Machine, Sanitary Napkin Destroyer Machine, Sanitary Napkin Burning Machine, and Automatic Sanitary Pad Burning Incinerator Machine. The range starts from 40 pcs per day to 1200 Pcs per day. 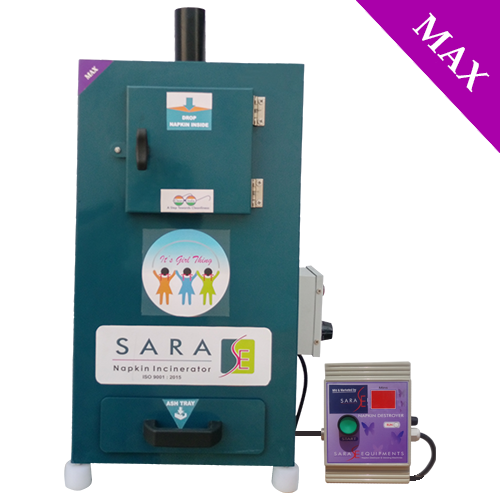 Looking for “Eco Friendly Sanitary Napkin Incinerator”?